SUMMARY: In existence for 15 years, the Highmark Inc. physician pay-for-performance program, Quality Blue, which continues to evolve, provides its 6,300 enrolled primary care physicians the opportunity to earn bonus payments across six measure sets, from clinical and quality measures to prescribing habits, access to care and level of technology use. 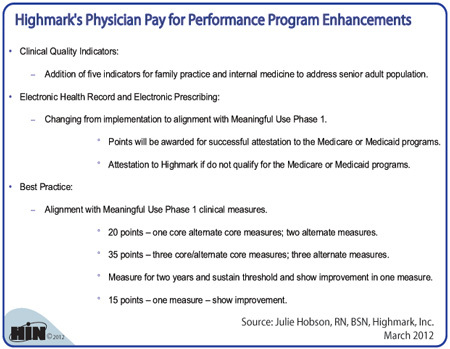 We wanted to review Highmark's restructured pay-for-performance program that includes Phase 1 Meaningful Use measures. Julie Hobson, RN, BSN, manager of provider engagement, performance and partnership at Highmark Inc.
"Our program restructuring to focus around meaningful use will begin in October. We have manipulated some pointage, taking some clinical quality indicators and generic brand, and providing it to the best practice because this is a huge undertaking for practices. Plus, with us going with meaningful use, we will be requiring a higher involvement with that. We are changing our EHR and eRX away from just purchasing an implementation and changing it to implementation and aligning with meaningful use, Phase I. Points will be awarded to those that are able to successfully attest to CMS or the State Medical Assistance Program for meaningful use. We know that not all providers will be able to attest to either one of these, so we have created a process for those practices to attest to Highmark saying that their EHR successfully meets all the metrics in the CMS program. This would mean the core set measures, as well as the clinical core and alternate measures." During this webinar replay, Julie Hobson, RN, BSN, manager of provider engagement, performance and partnership at Highmark Inc., described how Highmark's pay-for-performance program has evolved to meet today's healthcare market realities. Physician Pay-for-Performance: Refining the Bonus Structure to Meet Market Realities is available from the Healthcare Intelligence Network for $129 by visiting our Online Bookstore or by calling toll-free (888) 446-3530.